Intimidate Cancer & Intimidate Leukemia, the fundraising wing of Intimidation Clothing, is pleased to partner up with sponsored amateur fighter Jeremie “Big Elk” Elkins in support of his 14-year old niece, Alyssa. Alyssa is currently in Children’s Hospital in Central Ohio and was just diagnosed with Myelodysplastic Syndrome, a form of cancer. Jeremie’s brother needs help with medical expenses for the long road ahead. Any help is greatly appreciated, as Jeremie asks that we all “please keep her in your thoughts and prayers.” A GoFundMe page has been created to help Alyssa’s family as well. Intimidate Cancer & Intimidate Leukemia have released their own assistance to the family with the “Help Alyssa Intimidate Leukemia” tee, available for sale now at IntimidationClothing.com. A portion of the sale of each shirt will go back to the family to help Alyssa’s family offset medical costs and travel costs associated with the Myelodysplastic Syndrome treatment. Myelodysplastic Syndromes (MDS) are a group of diverse bone marrow disorders in which the bone marrow does not produce enough healthy blood cells. MDS is often referred to as a “bone marrow failure disorder”. MDS is primarily a disease of the elderly (most patients are older than age 65), but MDS can affect younger patients as well. To help you better understand MDS, it might be helpful to first consider some basics about bone marrow and blood. The bone marrow functions as a factory that manufactures three kinds of blood cells: red blood cells, white blood cells, and platelets. Healthy bone marrow produces immature blood cells — called stem cells, progenitor cells, or blasts — that normally develop into mature, fully functional red blood cells, white blood cells, and platelets. In MDS, these stem cells may not mature and may accumulate in the bone marrow or they may have a shortened life span, resulting in fewer than normal mature blood cells in the circulation. Low blood cell counts, referred to as cytopenias, are a hallmark feature of MDS and are responsible for some of the symptoms that MDS patients experience — infection, anemia, spontaneous bleeding, or easy bruising. Anemia (low red blood cell counts), neutropenia (low white blood cell counts), and thrombocytopenia (low platelet counts) are the major types of blood cell cytopenias, and are discussed below. In addition to reduced numbers of blood cells, the mature blood cells circulating in the blood may not function properly because of dysplasia. The formal definition of dysplasia is the abnormal shape and appearance, or morphology, of a cell. The prefix myelo- is from the Greek and it means marrow; so myelodysplasia refers to the abnormal shape and appearance — or morphology — of the mature blood cells. Syndromes comes from the Greek and means a set of symptoms that occur together. Failure of the bone marrow to produce mature healthy cells is a gradual process, and therefore MDS is not necessarily a terminal disease. Some patients do succumb to the direct effects of the disease: reduced blood cell and/or reduced platelet counts may be accompanied by the loss of the body’s ability to fight infections and control bleeding. In addition, for roughly 30% of the patients diagnosed with MDS, this type of bone marrow failure syndrome will progress to acute myeloid leukemia (AML). > Order the “Help Alyssa Intimidate Leukemia” tee today! Intimidate Cancer, a division of Intimidation Clothing, LLC, focuses on helping families impacted by cancer, leukemia and other diseases offset their medical bills by selling branded tees. Designed as a fundraiser brand, Intimidate Cancer has worked with a variety of fundraisers and families by not only designing and printing high-quality apparel, but also helping promote their cause. Those interested in learning more about the Intimidate Cancer brand and fundraising opportunities can contact Intimidation Clothing for details. Intimidation Clothing, along with its exclusive Intimidate Cancer line, is pleased to announce its sponsorship of the upcoming Family Fundraising Day put on by the Hubbard Leukemia Society near Youngstown in Hubbard, Ohio. Intimidation Clothing will be on hand selling its popular Intimidate Cancer line, where a portion of the proceeds to directly toward cancer research and awareness. The event is designed to promote awareness for the leukemia society in the Hubbard, Ohio area. Along with its Intimidate Cancer line of t-shirts, Intimidation has also added Intimidate Leukemia tees as well as popular new Intimidate Cancer wristbands and more. 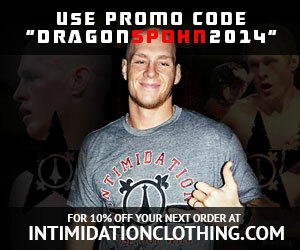 In addition, a few select Intimidation styles will also be available for sale at the event. For fundraiser opportunities please contact Intimidation to learn more about the many options on how Intimidation Clothing gives back and supports cancer research & awareness. Intimidation Clothing is a fast-growing brand of lifestyle clothing with a growing International presence and over 50 authorized dealers across the USA and beyond. Known as a big supporter of local MMA with roots in the combat sports industry, Intimidation launched the Intimidate Cancer division in 2013 and continues to work to help families in need and donate to cancer research. The Intimidation brand is regularly featured on multiple sporting events on SpikeTV, AXS TV, SportsTime Ohio, MTV2, FUEL TV, The Comcast Network, Comcast SportsNet and EpixHD as well as MMA highlight shows on Spike TV, AXS TV and more. In addition to over 110 styles of high-quality, bold t-shirts and sweatshirts for men, women and children and is also known for their premium-quality EliteFighter MMA board shorts. Anyone interested in becoming a dealer can apply to sell the Intimidation brand as a dealer and they can be found for sale online at IntimidationClothing.com. Fans can also follow the marketing wing of the Intimidation brand, Intimidation Interactive Media, @IntimidationIM, like Intimidation Clothing on Facebook or follow @IntimidationMMA on Twitter. Intimidate Cancer is pleased to have completed our first private fundraiser benefiting Jillian’s Angels. Jillian (pictured right with her cousin), an 8-year old from rural Northeast Ohio, was diagnosed with ependymoma (cancer of the brain and/or spine) in September 2011 at the age of 6. When it was discovered, she had a huge tumor in her brain that was almost half the size of her brain. She was extremely lucky to have made it through that surgery – her family was told us if she lived through it she would be a vegetable, she would have no memory or be able to walk and talk. When Jillian awoke after the surgery she could do all those things, thus beating all of the odds. In October 2013, during a routine MRI, her doctors found two small tumors that had grown back in her brain and had spread to her spine. In November of 2013, in a span of four days, Jillian had brain surgery followed by spine surgery where the doctors removed all that they could see. Because her cancer is very aggressive, she needs high dose radiation as that is the only thing proven to kill her type of tumors. However, in 2011 she had the maximum dose of radiation to her brain, so she cannot receive that treatment level again. In December 2013, Jillian began having one day radiation treatments to the brain followed by max doses of radiation to her whole spine, top to bottom, to try to prevent the spread any further. At the completion of of the radiation treatments Jillian will also receive low-dose chemotherapy treatments. Intimidate Cancer stepped in to help the family in November 2013 and work alongside with other family fundraising events including a Chinese Auction at the Ashtabula Towne Center and a fundraiser for Jillian and four other families in need at Pymatuning Valley High School in March 2014. Intimidate Cancer is a division of Intimidation Clothing, LLC. With a mission of helping to fund cancer research and assisting families or individuals in need, Intimidate Cancer is open to public or private fundraisers offering branded shirts and more. Intimidation Clothing is a fast-growing brand of lifestyle clothing with a growing International presence and over 50 authorized dealers across the USA and beyond. Known as the biggest supporter of local MMA, the Intimidation brand is also regularly featured on multiple sporting events on SpikeTV, AXS TV, SportsTime Ohio, MTV2, FUEL TV, The Comcast Network, Comcast SportsNet and EpixHD as well as MMA highlight shows on Spike TV, AXS TV and more. In addition to over 110 styles of high-quality, bold t-shirts and sweatshirts for men, women and children and is also known for their premium-quality EliteFighter MMA board shorts. Anyone interested in becoming a dealer can apply to sell the Intimidation brand as a dealer and they can be found for sale online at IntimidationClothing.com. Fans can also follow the marketing wing of the Intimidation brand, Intimidation Interactive Media, @IntimidationIM, like Intimidation Clothing on Facebook or follow @IntimidationMMA on Twitter. The Intimidate Cancer division of Intimidation Clothing, LLC took another huge step forward on Wednesday, February 12th joining the PV Pink Out girls’ basketball game fundraiser in Andover, Ohio. Held at Pymatuning Valley High School, the annual event featured a variety of fundraiser sales for breast cancer research & awareness and a sell-out crowd. The hometown crowd, clad predominantly in pink throughout the night while waving pink towels and more, was treated to the Lady Lakers completion of a perfect 20-0 season which has them ranked #1 in the State of Ohio’s Division III Rankings. Joining a event-specific t-shirt sale, Chinese Auction, 50/50 raffle, bake sale and more, the Intimidate Cancer products were a huge hit with the fans. Started in 2013, Intimidate Cancer is a division of Intimidation Clothing, LLC aimed at raising funds for cancer research and awareness. The Intimidate Cancer line recently worked on a private family fundraiser as well to help assist a family with the bills associated with the brain cancer treatments of a 8-year old girl and is open to other private fundraisers. Intimidation Clothing is a fast-growing brand of lifestyle clothing with a growing International presence and over 50 authorized dealers across the USA and beyond. Known as the biggest supporter of local MMA, the Intimidation brand is also regularly featured on multiple sporting events on SpikeTV, AXS TV, SportsTime Ohio, MTV2, FUEL TV, The Comcast Network, Comcast SportsNet and EpixHD as well as MMA highlight shows on Spike TV, AXS TV and more. In addition to over 110 styles of high-quality, bold t-shirts and sweatshirts for men, women and children and is also known for their premium-quality EliteFighter MMA board shorts. Anyone interested in becoming a dealer can apply to sell the Intimidation brand as a dealer and they can be found for sale online at IntimidationClothing.com. Fans can also follow the marketing wing of the Intimidation brand, Intimidation Interactive Media, @IntimidationIM, like Intimidation Clothing on Facebook or follow @IntimidationMMA on Twitter. From the makers of Intimidation Clothing comes the Intimidate Cancer line. A project years in the works, the purpose of the Intimidate Cancer line is to help raise awareness as well as funds for cancer research as a portion of the proceeds from each Intimidate Cancer item sold will be donated to cancer research or families dealing with cancer. Along with the current styles featuring pink ribbons, the the international symbol of breast cancer awareness, addition ribbon colors will be added over time and as specific fundraisers take place. In addition to donating a portion of the proceeds from each Intimidate Cancer item sold to the American Cancer Society, Intimidation Clothing is also open to working with private fundraisers and customizing shirts for those events. In stock merchandise is already listed online on the company’s Web site in the Intimidate Cancer section. For details please follow Intimidate Cancer on Facebook or contact Intimidation Clothing.